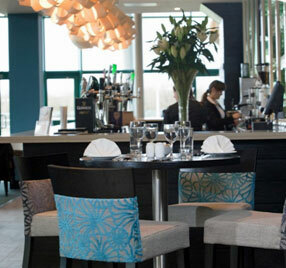 The University of Limerick has a wide variety of cafés and restaurants available. All of these cafés and restaurants also provide you with an opportunity to meet friends and colleagues from around the world in a relaxed and congenial manner. There are also small shops on the campus or nearby where you can buy food and prepare it in your accommodation apartment. With so much on-campus choice we feel confident that you will find something suitable for your diet and circumstances. For those staying on campus continental breakfast will be delivered to your apartment each morning and will consist of: Brown bread, cereal - porridge/muesli, fruit/yoghurt, juice, jams and peanut butter, low fat spread, butter, milk, sugar, tea, herbal tea and coffee. Your breakfast will be waiting for you each morning in your apartment. If you want anything more such as eggs etc, you can buy these from the campus shop, store them in your refrigerator, and use the cooking facilities in your apartment. In the City of Limerick itself, there is also a wide variety of pubs and restaurants if you choose to venture out in the evening. For a selection of restaurants in Limerick visit the Georgina Campbell website. Your on-site options for eating and drinking are below. Please click on various venues to obtain sample menus and prices. The University also has a list of cafés and restaurants here. Located in the Irish World Academy, Blas Cafe is operated by Cafe Noir, a group of French inspired coffee houses. Serving patisserie, artisan breads, breakfasts and hot lunch daily. Café Allegro is a comfortable and relaxed venue located in the Foundation Building (University Concert Hall). A selection of salads, soups, coffee and confectionary are available daily. Café Verde is located in the Health Sciences Building and serves a variety of soups and salads, ice cream, smoothies and sandwiches. View website. 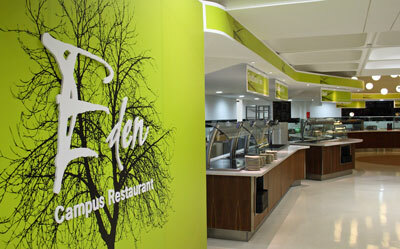 Eden is the university's main self-service restaurant. Located in the Main Building, Eden offers a wide range of food options, freshly prepared with local ingredients and at great value. View website. The Pavilion restaurant and bar offers a comfortable place where visitors can relax all day, and enjoy a delicious selection of handmade pastries, cakes & tarts over a coffee. It serves a varied lunch menu daily as well as a sumptuous evening menu. View website. Located in the Student Centre, the Paddock Restaurant provides self-service breakfast and lunch. While a variety of hot dishes are available throughout the day, sandwiches and rolls are made to order. View website. Located in the Main Building, Red Raisin is the home of Subway, Starbucks and Pizza Pronto. Sandwiches and confectionery are also available during the day. View website. The main campus bar, the Stables Club, offers food and beverages all day. Located in the main social hub, it will be one of the main social gathering places for the Congress. View website. The Scholars Club and Bar is located at the heart of the University of Limerick's Student Centre and provides food and beverages in a relaxed and intimate environment. The Club has a carvery every day and can cater for up to 80 people. View website. A map of UL showing cafés and restaurants will be available here before the Congress.